Everything about this Reuters piece about a possible breakthrough in Chinese-North Korean cross-border tourism is great, until: “The [tri-national] zone is the latest push by North Korea to transform itself into a tourist attraction.” While it is true that North Korea has spent a huge amount of money on tourism prestige projects (i.e., Masik Pass Ski Resort) since Kim Jong-un came to power, it is far too early to attribute them with any agency whatsoever with respect to a new tourist project which appears to be, in point of fact, very much a “Chinese dream” (TM) of provincial officials in Jilin. First, they appear to have erected some kind of tourist welcome center at the foot of the Victory Monument in Namyang, the small city directly across from Tumen, PRC. While this was probably done back in April/May 2014, it makes sense to cite the progress now, when the perception of progress is needed, even if this facility in its totality consists of a tent and a desk which can be rolled up and stored easily the next time a quarantine is announced. 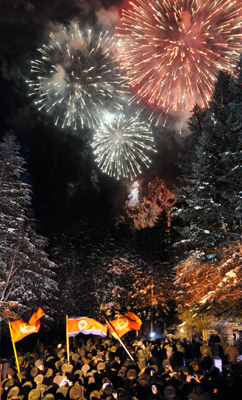 Fireworks at ‘Jong-il Peak’ for the Dear (deceased) Leader’s birthday in 2012. The second North Korean contribution to the project was the launching of a few fireworks from Namyang at about 7 a.m. on New Years’ Day 2015. Fireworks! What could be more exciting? Besides enough electricity for the evening news, consistent attendance at regional fora, and a link to China’s roaring new high-speed rail (arriving this year in Yanji, Tumen and Hunchun), it’s hard to imagine of anything more exciting or worth the outlay of huge emotional and financial investment than fireworks. Well, besides ice sculptures for child pilgrims. Everything still suggests the following: a.) the Tumen River tri-national borderless tourism zone scheme is purely in the planning stages, sort of like the Greater Tumen Initiative has been for about the past 25 years, and, b.) it has been more or less put forward by the folks in Jilin/PRC without North Korean participation. I think that by releasing this information about the proposed zone, Chinese state actors are trying to build some momentum for a project that got momentarily derailed by the Jang Song-taek purge (if this unpleasant event can be mentioned; it is occasionally relevant still). Naturally, it is good to keep recent perspective in mind when viewing these things, or to be more precise, to recall how short-lived optimism can be with respect to cross-border tourism in precisely this area. Barbara Demick’s June 2011 article for the Los Angeles Times about a then-exciting joint project between Dandong and Sinuiju is also very instructive when revisited today. An imbalance of publicity about such an event can indicate varying levels of commitment. And it goes without saying that North Korean state media did not say a word about the fireworks along the Chinese border, just as North Korean state media ignores a hulking bridge which is, factually speaking, by far the most impressive visible piece of infrastructure work achieved in the Kim Jong-un era. When I was in Tumen last April, a once-weekly passenger train was finally allowed over the border — which then abruptly closed not all that long thereafter to Chinese tourism on account of North Korea’s hyper-intense Ebola quarantine. This is not to say that the publicized project could never happen, or will not happen anytime soon, but the present reality suggests that North Korea’s primary contribution to the project thus far literally vanished in a puff of smoke on New Year’s morning. As February turns to March and the southern border of the DPRK becomes thunderous with tank fire and anti-tank fire, we would do well to keep our eyes peeled for puffs of rather more promising smoke on the northern border.